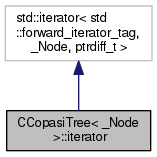 A forward iterator used to traverse the tree. Definition at line 81 of file CCopasiTree.h. Definition at line 99 of file CCopasiTree.h. Definition at line 107 of file CCopasiTree.h. Definition at line 114 of file CCopasiTree.h. Definition at line 133 of file CCopasiTree.h. Definition at line 120 of file CCopasiTree.h. Definition at line 152 of file CCopasiTree.h. Definition at line 126 of file CCopasiTree.h. Definition at line 141 of file CCopasiTree.h. Definition at line 90 of file CCopasiTree.h. Referenced by CCopasiTree< _Node >::iterator::operator!=(), CCopasiTree< _Node >::iterator::operator*(), CCopasiTree< _Node >::iterator::operator++(), CCopasiTree< _Node >::iterator::operator->(), and CCopasiTree< _Node >::iterator::operator=().